Ожидается поступление на склад г.Москва: 13 мая 2019 г. — 10 000 шт. 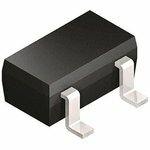 High speed small signal switching diodes from Infineon with current ratings of up to 1A and reverse voltage ratings of up to 400V. Many of these devices are available in dual, triple and quad configurations.